Front page news in the Daily Telegraph today (link below) and billed online as ‘Chaos over biggest employment tax shake-up in 70 years‘. The Daily Telegraph informs us that “under the new ‘Real Time Information’ (RTI) system, more than a million businesses – as well as charities, churches and families who employ nannies or cleaners – must report immediately any wage payments to the taxman. The Chartered Institute of Taxation says that many small businesses were thinking of folding because the system is the last straw in a long line of excessive bureaucracy from the taxman. It described the RTI as a possible ‘route to insolvency'”. Amen to that. About a quarter-century ago an anthropologist by the name of Joseph Tainter described in detail how societies like ours get in to intractable difficulties over time. 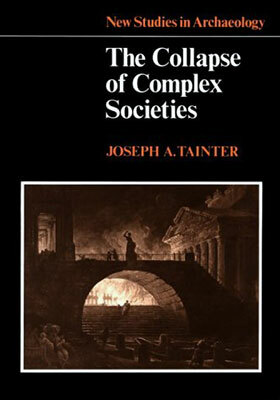 In essence, history shows that societies tend towards collapse as their rulers load ever more layers of complexity on complexity in never-ending efforts ‘to solve problems’. Each time a layer of complexity is added, the amount of work (energy) needed to sustain complexity goes up, and the benefits (marginal returns) on that aggregate complexity diminishes. Eventually the society simply lacks the resources (primarily, but not exclusively the ‘master resource’ energy**) and the will to sustain non-productive complexity – and so the complex society collapses. It’s happened this way, with variations on the theme, throughout history to societies like those of the Western Chou Empire, The Harappan Civilisation, Mesopotamia, Mycenaean Civilisation, The Egyptian Old Kingdom, The Hittite Empire, The Western Roman Empire, The Olmec, The Lowland Classic Maya and others. Tainter’s book is called ‘The Collapse of Complex Societies‘ and is prescient – especially when one learns of yet another layer of almost unmanageable complexity like this latest piece of abject nonsense being inflicted on our society by our rulers. I don’t suppose that the new RTI system will collapse western civilisation later this month, but it is another excellent example of how rulers try to solve problems by imposing ever more pointless complexity on their societies. In this case to make it ‘easier’ to pay welfare benefits. Whatever happened to Occam’s Razor, aka ‘Keep It Simple, Stupid’ (KISS)? ** On the link between ever growing societal complexity and energy usage, have you noticed the trend cost of energy over the past decade or so? You may wish to take a look at one of my earlier posts, ‘Energy – Reality Intrudes’. Richard, Nail & head! We are on the Titanic (or good ship venus) with Georgie boy at the helm, Cameron giving suicidal instructions with the crew made up of bent politicians & vested interest.. A change of direction is needed but i cannot see any of he main parties doing this.. A Mind Revolution is needed..
On the subject of tax, has anyone noticed that the solution to public debt and deficit from all politicians is more tax, not less spending? Although the Conservatives and Lib Dems pay lip service to deficit reduction , they are actually actively adding to debt. Labour will continue this process after 2015 until our national debt reaches the levels of Japan. The system will have to blow up before any politician addresses it. Educate your children (or grandchildren) and give them the qualifications to go abroad. “Learn and Leave” should be the motto of the next generation; the good ship Britannia is heading for the rocks, commanded by the worst bunch of dishonest, immoral and incompetent politicians we have ever had. The worst part is that if you’re paid by BACS then BACS also have to send HMRC details of how much was paid NET. What’s that for, except to double check employers and snoop further? I rather believe it is simply to grub as much tax as possible as quickly as possible regardless of the cost or damage it will do. They simply don’t care. We urgently need to control them. That way we have ot agree to this sort of hogwash and can say, quite clearly “No” at any point for anything these fools want to do. How about doing away completly with the tax system and all of its rebates/offsets for companies and private people,all cash tills registers will be linked via a secure internet connection to the tax office and at the end of the day 5% sales tax is levied on all that is sold.The same applies to companies as well.All the people working in HM tax offices will not be made redundant but instead work internally for the police or other HM instituations.The Police are always complaining too much time is spent on administration work Voila! I am generally against taxes that the people are not ‘deciding’ to pay. Part of the issue we have is that ‘TPTB’ feel they can do whatever they wish and there is nothing the people can do about it. If, however, taxes were paid by a will-full act of the citizen, the politicians would live in fear of a general tax strike. More than that, taxes are part of the agreement between the citizen and state and as such, the payment of taxes should be always be voluntary and never simply taken by the state. As a business owner, ‘Amen to that Minty’. UK tax is already so complex that I pay an accountant to sort all my tax stuff out, at no small expense. This RTI is more cost, that has little, if any, real benefit. This is more to do with the fact that they ‘can’ do it, rather than they should. If the government was not so massively bloated (>50% gdp when it should be absolutely no more than 25%) it could get rid of most taxes and the associated administrative burdens could be converted to real productivity. – but as we are now in our fourth successive term of socialist government, there is, sadly, no light at the end of that tunnel.